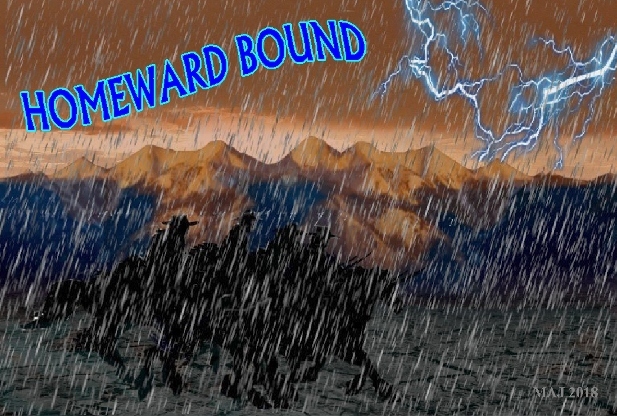 Four men rode through the rain that pounded down on them relentlessly. The horned horses they rode grumbled often in discomfort. They were all soaked to the bone and there wasn't a dry place on man or beast. The wind pressed moisture into every crease no matter if it was covered or not. Rolling, dark grey clouds flew across the grey sky and occasional lightning flashed above the land. 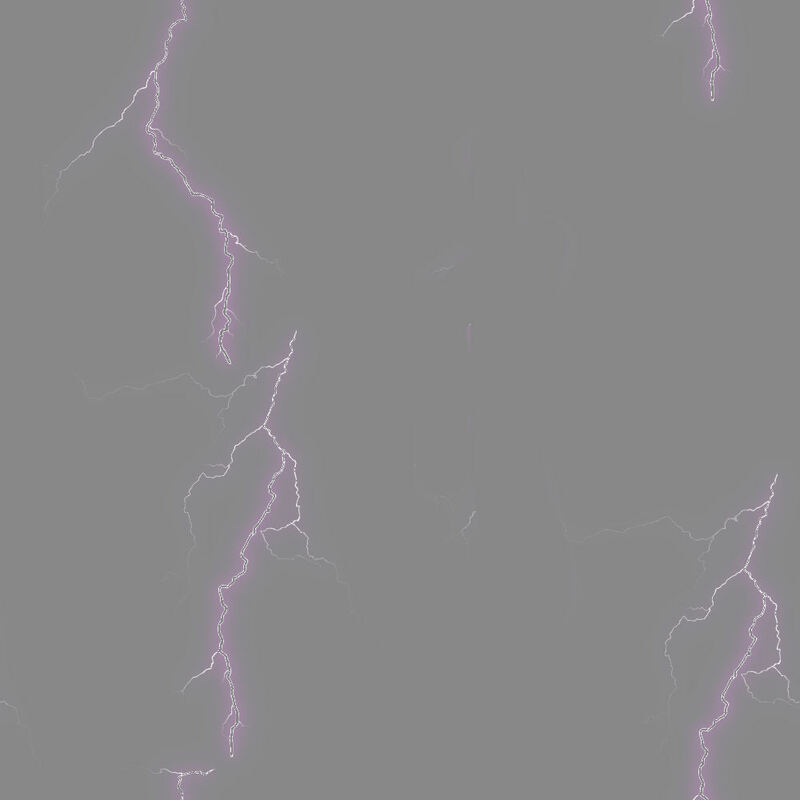 Thunder crashed so loud that it felt like it shook the land. With each earsplitting boom, it seemed that the rain came down hard for several minutes before the downpour settled once more into the steady, heavy rain. A distant glow illuminated mountains in the distance, but the sight was fading with what little light was left of the day. They pushed their mounts through the land that had turned into a giant mud bog. The strong horses were tiring and the men were swearing. They didn't have time to stop and wait out the storm. They slowed to a walk when they came to an impassable area. Lit brightly for a moment by a lightning flash, they pulled their horses to a halt. Water ran deep and swift in front of them. There was no sign of the trail or a road to be seen. They couldn't see across the water but knew ahead of them lay some rough, broken ground for a couple of miles. The land fell and rose several feet in many places and dropped off into deep gullies elsewhere. In the semidarkness, and with all the water, no one could see where the dangerous ground lay. Vin swiped the blowing rain from his face and looked at his companions. The three were as wet and miserable as he was, but they needed to keep going. They had to get back to town. "Which way brother?" Josiah asked as he stared out at the churning water. Ezra and Nathan crowded close. "Can't go that way. We have ta' to go around." Vin said as he pondered on which way would be the fastest. "Mr. Tanner, please don't delay. I am not the only one miserable, however, we are needed at home." "I know Ezra," Vin snapped as he looked to the north then the south. With a shake of his wet head, he turned his black stallion to the north. "Sorry Ez. Think this will be the fastest way. At least the land should be better. Hope it isn't flooded too." With nudges, the riders turned their horses and cantered after Vin. Trusting him to find a way to get them through the mud-covered landscape. Nathan, one of the riders, hoped they would arrive in time. Each of them carried vaccine in their saddlebags that they needed to get back to 4C with. A flu-like epidemic had hit the town when the last busload of travelers stopped over for a night. A woman became sick, and by morning her husband was down. Everyone they came in contact with, was now bedridden with fever and headaches, and unable to keep anything down. Nathan promptly radioed a couple of other towns and found some were suffering from the same virus. A dose of a vaccine he didn't have, seemed to be the only thing that helped. After more calls, he managed to get some vaccine sent out from Denver, but the train got stopped hours from 4C. Held up in a small, new town, when the engineer came down sick. It would be there for several more days until the man got over the sickness, or another engineer could come in to take his place. Since the town was a day's ride from 4C, it was decided they would go after the vaccine. The four men set out two days ago, leaving the others to look after the town. Chris was down sick, and JD appeared to be coming down with the sickness. Buck remained up and took over helping Rain when they left. Nathan hoped they could get home before the whole town became sick. So far, no one in 4C, that he knew of, had died. He found out there were deaths in several other stricken towns. Nathan administered the vaccine to the sick engineer. Also, the people who were caring for the sick man, and anyone who had been in contact with him. Once he finished, they loaded their saddlebags with the vaccine and headed out. The rain caught them hours ago, slowing the last part of their trip. At least they were closer to 4C. Once they found a way to get around this water problem. Vin finally found more solid ground, and they pushed their horses into a gallop, happy that the sucking mud was behind them. Vin figured they were maybe four hours from 4C. They all hoped nothing else would hamper them. Lightning flashed overhead once more, but the thunder's crashing noise was farther away. Hope sped through the men that the wind and rain would stop. With the storm raging around them, it made it impossible to radio 4C. Having been recently upgraded, the radio could reach a longer distance, however, with this kind of weather they needed to be closer to town for any of the radios to work correctly. As they raced along an almost unseen trail, Vin sneezed mightily and Ezra pulled his wet coat and slicker tighter around him. Both young men were feeling the cold seeping into their bones, had been for a while. Vin glanced at Josiah and saw him hunched in his saddle. He wondered if the big man was getting sick. In the grey semi-light, he couldn't really see any of his friends' faces, but their body language spoke volumes to him. They were suddenly close to a rock outcrop and the wind and rain abated a bit as they came abreast of it. Vin pulled up for a moment to make sure the others were all right and give the horses a couple of minutes rest. "What's wrong Mr. Tanner?" Ezra asked before anyone could speak. "Nothin', just wanta make sure ya all are still with me." "I do believe we are," Nathan answered as he wiped water from his face. "How are you all feeling?" His brown eyes went to Vin first, having heard the sneeze earlier. "I'm fine," the young man answered instantly. "I too am fine, Mr. Jackson." "I will be fine once we get home and out of these wet clothes. A nice hot bath sounds extremely good right about now," Josiah added with a grin at using 'fine' also. "OK, sounds good. Let's go guys." Vin quipped and kicked Peso into motion. The three followed Vin, knowing he would get them home. Once more the country opened up. At last, the rain began to slack off and the wind dwindled. For a short time, they could see a little farther, even though deeper darkness was beginning to take over the land. The long dark shadows were lost in the descending blackness. 'Lord I hope we get home soon' Ezra thought as his horse stumbled and threw a large clod of mud up at him. He ducked as it flew over his shoulder. 'I am wet enough, don't need to be covered with sludge also.' He grumbled. Nathan, riding behind Vin, heard the young man sneeze several more times. He hoped Vin didn't come down with pneumonia. Or any of them. They all were wet and miserable. Two hours later Vin slowed Peso and peered ahead. The horned horses slowed to a walk with snorts and shook their heads. Wet manes threw rainwater all around. They blew loudly through their noses and stomped the wet ground. They knew they were close to home and wanted to continue. Suddenly the four horses went on high alert. their heads rose high, nostrils extended as they looked around. Their grumbles sounded in the quiet evening that had fallen over them. They began to fidget restlessly, heads swinging in different directions. "What's wrong brother?" Josiah questioned as he tried to calm his antsy horse. "Can't see them. I think there's wolves around somewhere. Not sure how close though. We're only a few miles from town. Need to let the horses rest a few minutes. We might have to fight to get to town." "Damn it! That's all we need," Nathan exclaimed. Fifteen minutes later Vin gave the signal to go and they raced towards town, guns or blasters drawn, ready for an attack. It evidently looked like a sign to the wolves, their howls rang out and they began to chase after the riders. The howls spurred the horses to greater speed. The men let the horses run full out and before long the wolves disappeared, giving up the chase. The four thundered into town and pulled up in front of the clinic, mud flying in all directions. Nathan gathered all the saddlebags and raced up the steps and inside. The others headed to the stables with his horse in tow. Having finally arrived in town, Nathan found Buck in the early stage of the virus and promptly confined him to a bed in the clinic. Nathan injected him after he finished with Chris and JD. Their sick friends would be up and around in a couple of days. Nathan and Rain quickly started giving the injections to the sick townsfolk, and the prognosis was good. A half-hour later they relaxed, hoping they managed to stop the spread of the sickness in the town. Less than two hours after their arrival in town, the four men were sitting around the wood heater in the clinic. They were drinking coffee and eating the cookies Rain made that morning. The men felt refreshed after having hot baths and getting into clean, dry clothes. A good, filling meal finished out the evening. Josiah and Ezra were thinking of heading off to their beds but weren't taking the first steps to move yet. It was warm in the clinic and they were enjoying the companionship. They eyed Vin who seemed to be more quiet than usual. Vin suddenly sneezed violently. Both Rain and Nathan turned towards him.